Refresh your profits this week with exotic drinks from AG Barr available between 22nd & 28th October 2018, we are guaranteed to offer you the best prices BARR NONE! For a winning choice and with up to 40.5% POR’s to be made, you can stock up on top of the range brands at competitive prices! 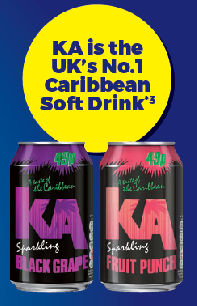 Retailers whose customers enjoy a taste of the islands can get ahead with KA, rated to be the UK’s number 1 Caribbean soft drink. This week, we have some more incredible beer offers from Heineken between 15th & 21st October 2018. 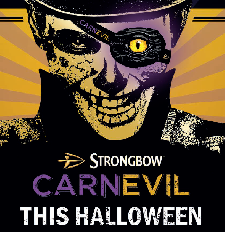 There are spookily high 20%+ POR’s to be made, backed up by the Carnevil Strongbow campaign to help prepare customers for Halloween. The campaign runs from 23rd October to 5th November 2018, so you can even use the back of this leaflet you pick up in our depot as a POS in your shops to incentivise customers to purchase this fine cider. According to Mintel research, in Britain, Halloween tends to be the second biggest party night after New Year’s Eve, with 40% of Britons purchasing Halloween products. In this case, Heineken is offering the chance to win a 5-night stay in New Orleans by customers inputting a unique code online to reveal an instant win. If this doesn’t sound like a winning recipe for profit, what more can you ask for? Grab refreshing deals from Heineken and watch your sales rise. Once again, you are guaranteed to be sipping on smooth profits with these fresh and crisp deals from Carlsberg, available only between 8th & 14th October 2018. Carlsberg is featuring the best buy in impulse, which is San Miguel with unbeatable POR’s of 40%+ on the bottles or 30%+ on the cans, you are bound to make instant sales if you stock up now. Growing 7.5% year-on-year, San Miguel is a brand that is backed up by a cinema, print and digital advertising to make customers fully aware of their beer. 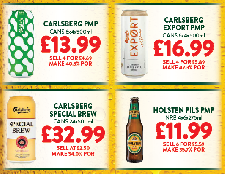 If your customers enjoy other beer brands, there are Carlsberg and Holsten Pils varieties on offer too, so take a look now.